How did a lion end up living on the roof of a Milwaukee library? How did a lion end up living on the roof of the downtown Milwaukee library? 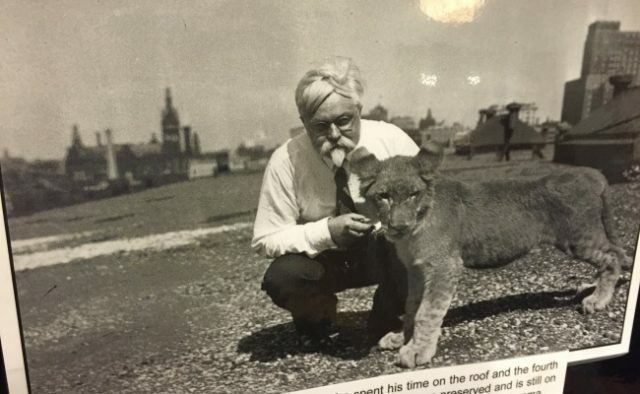 What if I told you there used to be a lion that lived on the roof of the Central Library in downtown Milwaukee? Sounds like an urban legend, right? For two months in 1929, a live lion cub had a home atop that iconic building overlooking downtown Milwaukee. In fact, it wasn’t too uncommon to see the cub, Simba, batting around a bowling ball and even wrestling with his human keepers. How did he get up there? Where is he today? Click the podcast player above to travel back in time to the late 1920s when the Milwaukee Public Museum and Library shared a space in downtown Milwaukee. Local history librarian Daniel Lee shares the story. And if you still don’t believe the tale, check out video of the playful wrestling match below. For even more about Simba, head to the Milwaukee Public Library’s dedicated website here.